Berry flavoured electrolyte mix with natural elderberry extract and added sweetener. Fast hydration, virtually calorie free. Trusted quality since 1992. Suitable for vegans. 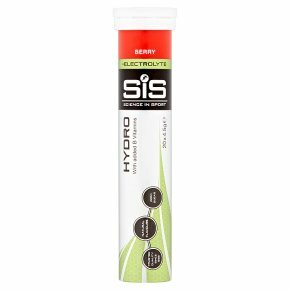 SiS GO Hydro contains precise levels of sodium and other electrolytes to hydrate you during intense exercise. Only 9 calories per serving, use before and during sport. Directions: Add one SiS GO Hydro tablet (4.3g) to 500ml of water and let it dissolve. Once prepared consume within 24 hours.